Adam has worked hard on the chicken coop and yard, and it's nearly done! 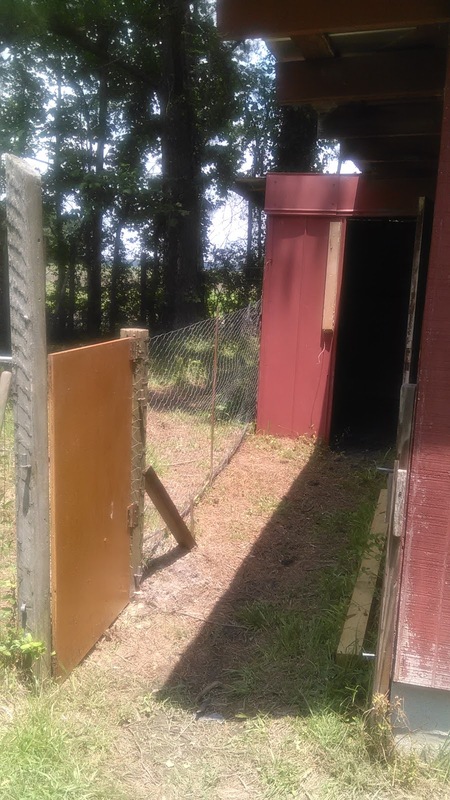 Now we have a walkway for us into the coop and new weighted fencing and a door into their yard. 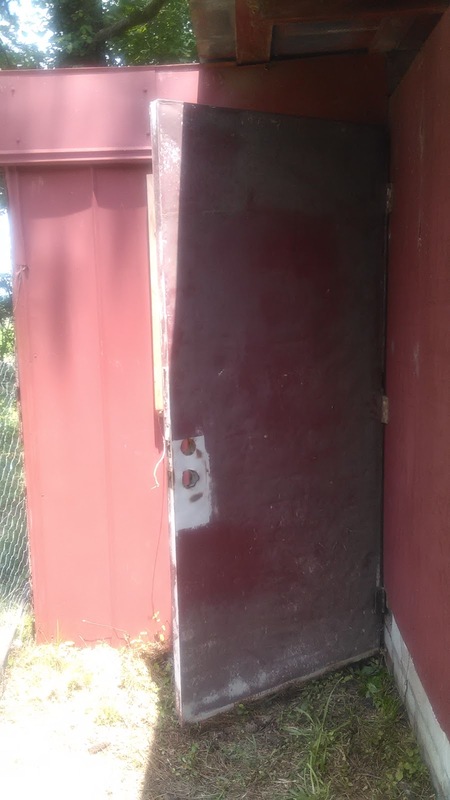 That door has a spring so it will close on its own quickly, and it has a latch, of course. Adam hung this door on the coop doorway with a big latch too. We want them to feel secure at night. I watch lots of videos from Becky's Homestead.com. 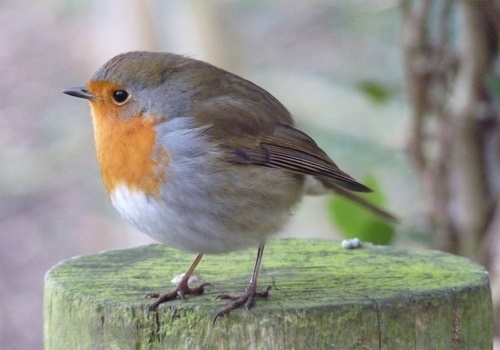 She lives in Florida, built her own homestead from scratch, and raises some happy birds. 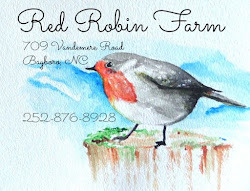 Plus, I have several good friends locally who do a great job with their chickens too. So I have lots of good teachers. 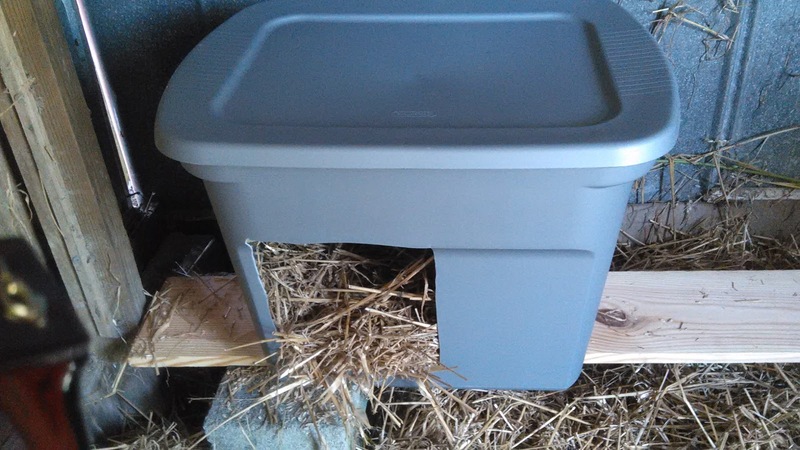 Becky recommends these laying boxes made from plastic tubs, so we will give them a try. They are cheap, private for the birds, and easy to clean. 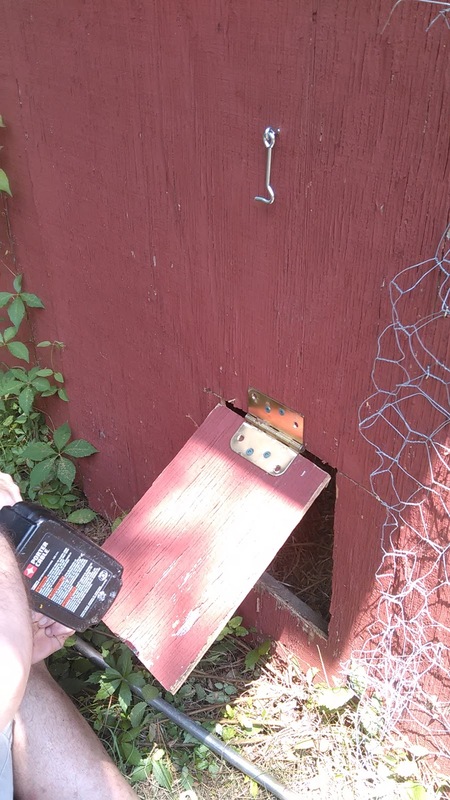 They're up off the coop floor on a 1x8x8 board on cement blocks. Close-up. Instructions for these boxes are found on Becky's site. 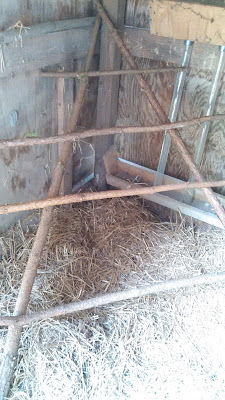 This morning while I was at the farmers' market Adam built a roost. 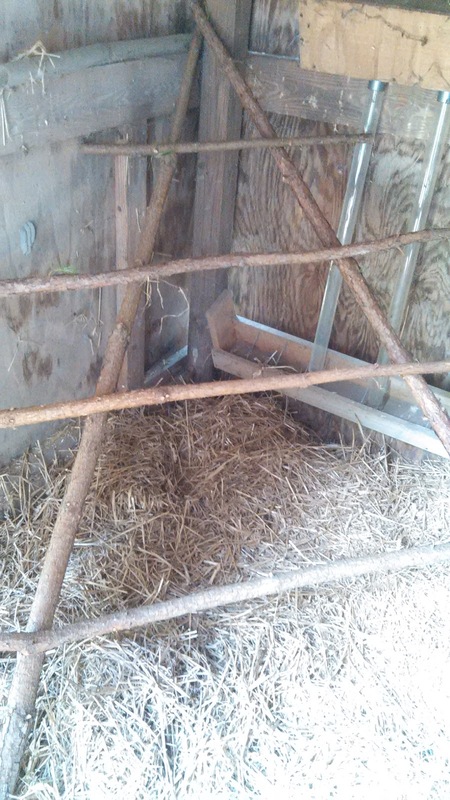 We'll only have four Barred Rock hens, quite young ones, at first, so this is plenty of roosting space, and two nesting boxes will be more than enough for them. We bought two bales of hay and 10 lbs. 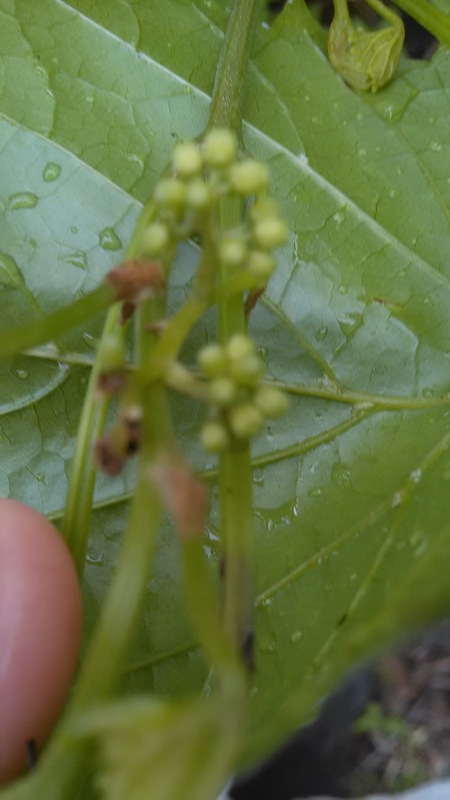 of start-and-grow feed to begin. I'm researching all the various advice about feeding. 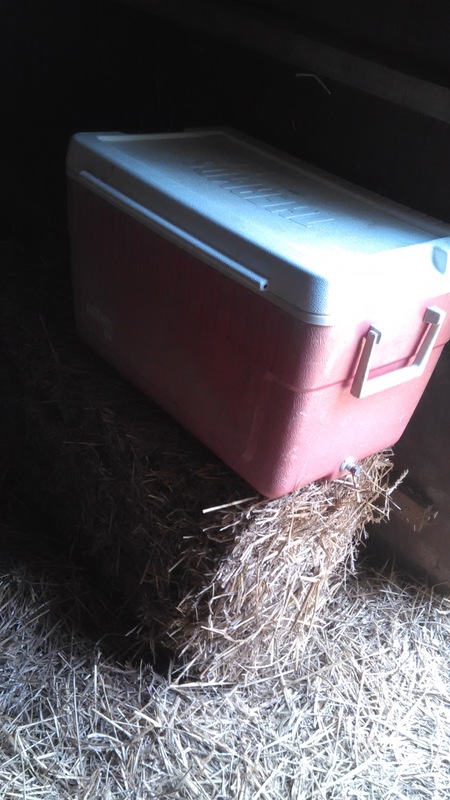 Becky recommends feeding oats also in the summer and whole corn in the winter. My chicken friend Bob says that's not necessary. Some say alfalfa. Some say crumble and some say pellets. All I know is that feed is expensive, and we don't want to buy anything that's not necessary or helpful. 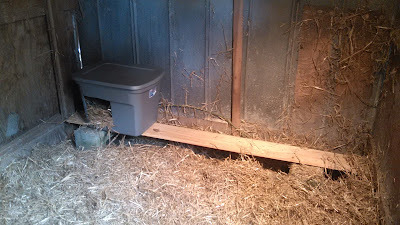 The feed will be stored in that cooler to protect it from mice. Adam cut a little chicken door in the side of the barn for them to go in and out. 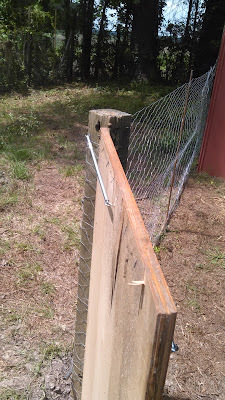 There's a hook to keep it open in the day and a latch to secure it closed at night. Becky says that chickens lay much better if they feel safe and are kept stress-free. So I want them to feel absolutely safe from predators. What's left? Install the waterer and a shallow feeder, which we have, and add four hens. 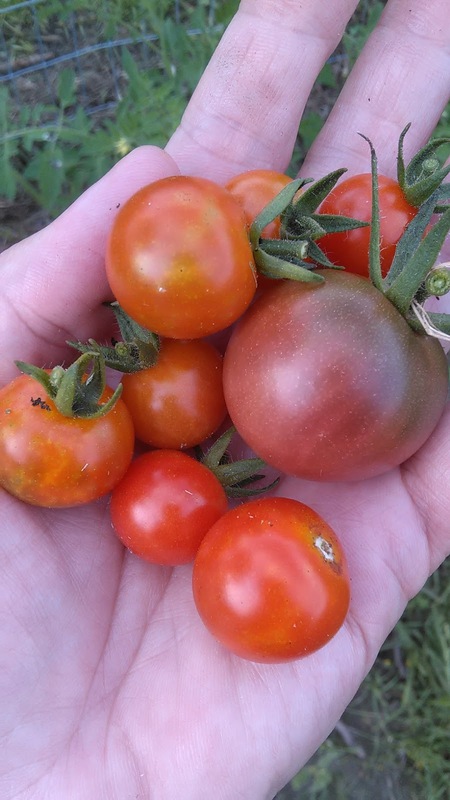 Each day we're getting a handful of tomatoes, and it will increase. I hope to take some to the market next Saturday. Our grape vines are putting out tiny grape clusters -- so cute! And our figs are ripening well. The peas are about done. I do enjoy how the harvest on a farm gently shifts from one plant to the next. Last but not least, Adam's sweet corn. It's quite a bit higher than this now; I took this photo about a week ago. 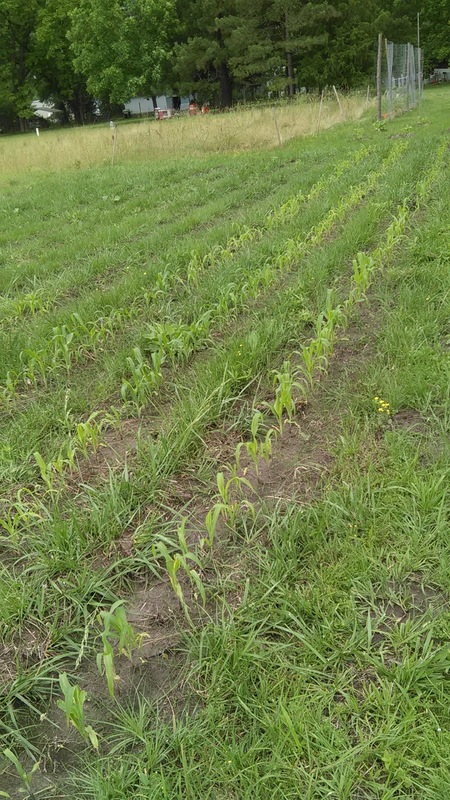 His corn is well behind other fields of corn locally, but for good reason. 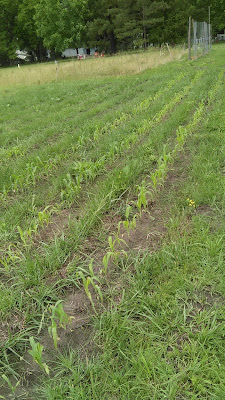 He looked up their schedule and planned for his corn to mature 2 - 3 weeks afterward, to prevent any cross-pollination. He doesn't want any contamination. So we may have to wait a bit longer, but hopefully we'll have better corn for the wait.